Bangladesh emerged as an independent country in 1971 after experiencing a genocide that cost millions of lives. Despite the fact that the US, a major superpower, extended overwhelming support towards Pakistan, Bangladesh fought a successful liberation war with a secular-nationalist vision. The nine-month long war devastated the country, thousands of women were victimized of sexual violence by inhuman Pakistani military, and millions were either internally displaced or took refuge in neighboring India. The birth of the country was soaked in blood, and it was a transformation of the seemingly forlorn Dream into a bright shining Reality. During the liberation war, both the cold war politics and South Asian regional dynamics came into play when Pakistan got the support of both the US and China, while Bangabandhu got help from India, known as a Soviet Union allay at that time. It is also to be noted that when Bangladesh faced the famine of 1974, the decision of the US government to call off food shipments on the pretext that Bangladesh was a ‘communist ally’ led to a grave ‘national tragedy’. It is a matter of great sorrow that the Jamaat-e-Islami, which opposed the creation of Bangladesh as a separate nation-state from Pakistan, still is in the country’s politics and enjoyed political power in alliance with a coalition government led by the BNP leader Begume Khaleda Zia from 2001 to 2006. Thus independent Bangladesh saw a shift of the political discourse of secular-nationalism, the cherished principle of Bangladeshi freedom struggle, towards Islamist tendencies in the recent past. In historical terms, the major politico-ideological debates in Bangladesh can be located first in the Bengali language movement after the partition in 1947, followed by the call for regional autonomy of Bangladesh, and subsequently, liberation war with the rise of Bangabandhu Sheikh Mujibur Rahman from the mid-1960s to mid-1970s. After Bangabandhu’s assassination, the successive military regimes of General Zia-ur-Rahman (1976-81) and General Ershad (1982-90) transformed Bangladesh from a secular to an Islamic country by changing the constitution and calling off the previous government’s ban on religious parties. Finally from the 1990s onwards, Bangladesh is struggling with conflicts between the restoration of democracy and political intervention of the military in national politics. In this context, it is absolutely necessary to unravel Jamaat’s position in various politico-ideological debates in Bangladesh and its role in the major political events and the present tussle between military and democratic regimes. In various discussions we are talking about Bengali culture, heritage, spirit and so on. But it is a cruel reality that the psychology of Bangladeshi people look westward to Saudi Arabia and the Gulf States for Islamic identity and are sometimes confused. They are going through a ‘more Modern, more Muslim’ tunnel. They consider religion to shape their identity instead of local anthro-cultural narratives and practices. This confusing concept of Bengali Muslims is playing a pivotal role for Jamaat-e-Islami politics. Besides this, there are some specific conditions under which the emergence of Jamaati Islamism in contemporary Bangladesh was possible. In post-75 era, a pro-US tilt of the successive military establishments tried to legitimize the Islamic parties. Thus an important factor that played a crucial role in revitalizing Islam as a political symbol in Bangladesh is the calculated strategy of successive military regimes of Zia and Ershad, which often in their search for political legitimacy on the one hand and in isolating the mainstream political parties like Awami League on the other directly or indirectly prepared the conditions for the rise of Islamism in Bangladesh. The successive military dictatorships under Zia and Ershad made compulsory religious education at schools, patronized madrasa education, besides encouraging religious leaders to play active role in politics of the country. 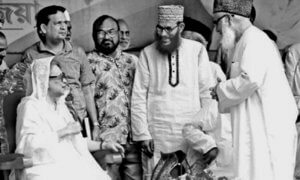 After Bangabandhu’s brutal assassination by a military coup, and General Zia-ur-Rahman’s subsequent alteration of the secular fabric of Bangladesh by calling off the ban of the religious parties, the Jamaat concentrated in building its organization. By assuming the President’s office on 21 April 1977, Zia amended the constitution by promulgating a ‘Proclamation Order’, the very next day— adding Bismillahir Rahmanur Rahim (In the name of Allah) at the outset of the constitution, while the words ‘liberation struggle’ in the preamble were replaced by ‘war of independence’, ‘secularism’ in the fundamental principles of state policy was replaced by ‘total faith and belief in the Almighty Allah’, and ‘socialism’ was explained as ‘economic and social justice’. A new clause was added to Article 25 ‘to the effect that the state shall endeavor to strengthen, consolidate and preserve the fraternal relationship between the Muslim states on the basis of Islamic solidarity’. This Islamization of Bangladesh constitution was done under Zia’s martial law when there was limited scope to protest against government measures. It was during Zia’s time that the Jamaat leader and the notorious war criminal Ghulam Azam was allowed to return to Bangladesh. After the assassination of Zia in 1981, General Hussain Muhammad Ershad seized power in 1982 in a bloodless coup. In late 1980s, he faced stiff opposition from a mass movement demanding restoration of democracy. Following such a political challenge from the opposition in 1988, when the BNP was taking credit of ‘having brought Islam back to Bangladesh’ and the Jamaat promoting an agenda of an ‘ideal Islamic state in future’, Ershad put forwarded the Eighth constitutional amendment as a trump card that declared ‘Islam as the State religion of Bangladesh’. No effective movement was organized against it. Bangladesh experienced the gradual erosion of mainstream political parties’ commitment to upholding secularism, which was one of the state principles enshrined in the constitution of 1972. It was a peculiar political situation as it was unclear whether the Muslim majority in Bangladesh actually wanted Islam to be the state religion. Surely there were no strong demand with massive mobilization hitting the streets for the state religion bill; neither had people openly opposed Islam as a state religion in similar fashion. In the midst of such circumstances, the secular-minded politicians and professionals appeared to be helpless and seemed to be shy in this delicate issue. 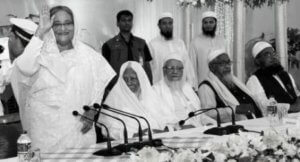 Similarly, in the late 1980s, the Jamaat was accommodated by the secularist political parties including the Awami League during the anti-Ershad agitations after 10-elected members of Jamaat-e-Islami first tendered their resignation on December 5, 1987, following which Ershad himself dissolved the National Parliament, the next day. The successive military regimes of Zia and Ershad in the late 1970s and throughout the 1980s only helped Jamaat to grow politically and organizationally, since both used the Jamaat to consolidate a support base for their respective military regimes. 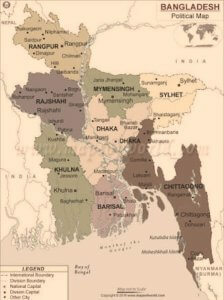 Both Zia’s BNP and Ershad’s Jatiyo Party (JP) opted for a balancing act of ‘Bangladeshi nationalism’ – characterized by majoritarianism and by legitimizing Islamic religion and religious parties to politics – that was distinct from the erstwhile Awami League’s assertion for ‘Bengali nationalism’. The re-emergence, prominence, and legitimization of Jamaat in national political landscape of Bangladesh also affected the political strategy of secular political parties like Awami League in using Islamic religious symbols, emblems, and even rituals to recreate its own image in the Islamic mold. In this regard, Jamaat too used these opportunities to grow further in Bangladesh so that it could influence the politics of the country in the future. Eventually, Jamaat became an important political player in Bangladesh while becoming the fourth largest party in Bangladesh and even supported the Khaleda Zia led BNP government in 1991 and 2001 with 18 and 17 seats, respectively, in the 300 seats Bangladeshi Parliament. Thus, the above accounts show that the story of Islamism in Bangladesh is linked to the transformation of illegitimacy of religious parties and their role in politics in the Bangabandhu regime to the legitimizing process of the same in the successive military regimes of Zia and Ershad. This re-legitimating process of the religious parties under military regimes culminated to the prominence of an Islamist and war criminal party like Jamaat in the national political scale of Bangladesh. Apart from the military patronage of Islamism, another account talks about the failure of the Left Movement in Bangladesh that created possible conditions for Islamism to grow in the country. The Left in Bangladesh has been historically weak with the migration of a big section of its leadership to West Bengal after the 1947 partition followed by state repression on the Leftwing forces in East Pakistan. In this respect, the historic parallel of the rise of Islamism in Bangladesh is with Egypt where Nasserism violently suppressed both the liberal democratic pole and the communist popular pole, which created a void that facilitated Islamism to emerge as a political opposition to Nasserite regime. Moreover, the Left Movement in Bangladesh was crippled with factionalism of middle-class leadership, which could not speak the language of the masses to become a popular party and external dependence on either Moscow or Peking for ideological, strategic, and tactical guidance. In such a scenario, the Left Movement in Bangladesh with its overtly middle-class character only remained as a mere middle-class intellectual vision with complete disconnect from the vast majority of the people. In such conditions, the disillusionment of the Bangladeshi people with the existing political class represented by Awami League, BNP, JP and the minutely fragmented and marginalized Bangladeshi Left gave a scope to the Islamist and militant politics of Jamaat that could promise an alternative Islamic order that they claimed was free from the evils and corruption of ruling political classes in Bangladesh. Political economy is one of the prime factors behind the rise of Islamism in contemporary Bangladesh. It is studied by the history that Islamism became popular in the 1980s and 1990s not only among a section of middle peasants and a squeezed urban middle class, but also among the disgruntled children of the state elite who were looking for an ideological alternative to the discredited nationalism of their elders and who sought to establish new links with people. Similarly, external pressures from oil-rich Islamic countries that have been funding Bangladesh over the years in various forms of aid and financial grants also significantly helped to revitalize Islamic symbols in Bangladeshi politics. Furthermore, the ideologically motivated, literate, and dedicated cadre-based organizational networks of Jamaat among various sections of the population and their mass dissemination and circulation of party literature also contributed to the rebuilding procedures of Islamism in Bangladesh. 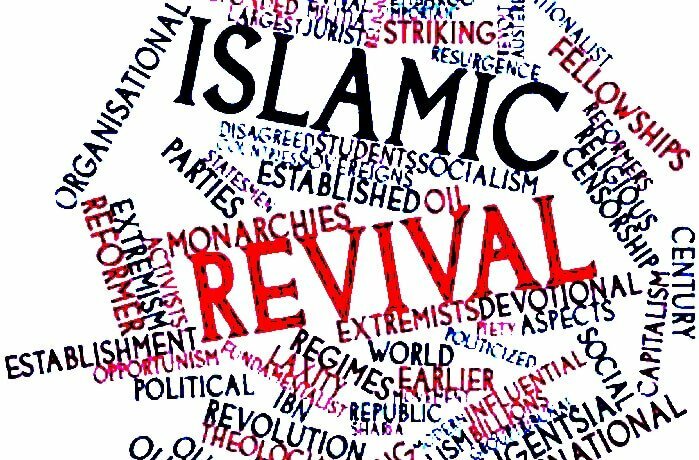 Finally, international events like Islamic revolt of Iran in 1979 and the success of Taliban regime in capturing political power in Afghanistan in the mid-1990s also rekindled Islamist politics in Bangladesh as these international events only reminded Islamist militant and fundamentalist parties like Jamaat about the revolutionary potential of Islam in the contemporary world. No doubt, the rise of Islamism in Bangladeshi politics has a vast political theory along with some broad discourse about the post-liberation politics of Bangladesh. In a nutshell, Jamaat-e-Islam, the notorious war criminal organization, has become a prominent player in Bangladesh politics with the aid of ‘Islamism.’ Jamaat has taken the opportunities of military and pseudo-military rulers to find its own niche audience. Political spinelessness in the history of post-75 era of Bangladesh creates the space for the Islamism, and Jamaat-e-Islam used it properly in independent Bangladesh. This is not a tragedy; it’s a mistake. A big political mistake. Maruf Rosul is an illustrious and politically conscious writer from post-liberation period of Bangladesh. He is concurrently a novelist, story writer, political analyst and reviewer whose writings are not only penetrating and poignant but also subjected to sporadic criticism. He is the author of nine major novels and a compiled book consists of the historic documents of Shahabag Movement published in 2015.